“You see that ship. That’s our ship,” says Karsten Saevik, as he directs our attention to the virtual image of one of his platform supply vessels on a computer screen in a darkened room. Saevik is one of four shipping bosses whose crew skills needs will be met at the new Faasnavaag Ocean Academy. We arrive five days from its opening, and with the drywall still drying, we look move closer to a giant white sphere indicating a bridge simulator in the wide-open reception. “Definitely, this is our human capital development center for marine skills,” said Saevik. Before long we’re at the DP-room, where candidates and crew train to use a vessel’s dynamic positioning controls and thrusters or earn a DP Licenese. New European Union and International Maritime Organization rules from 2016 will prohibit the performance of tasks for which crews have not received this type of training. Although, there’s a Ship Modeling & Simulation Center in Trondheim some 220 km to the northwest, Faasnavaag is “the northernmost (sim-center) in the world,” a nod to the Arctic’s increasing importance offshore Norway. Faasnavaag’s relative remoteness makes it prescient to build a concert hall, hotel and cinema on the same spot, the very quay at Vaalsnes Yard, where the first Norwegian supply vessel was converted from a fishing vessel back in ‘72. The Academay with urban amenities is a $59.2m investment by 9,000 local taxpayers, the fleet owners and a property magnate. The four local shipowners whose combined fleets are worth $5.3 billion — Olympic, Havila, Bourbon, Remoy — contributed with $7.9m in share capital. In all, there are eight offshore and coast guard (Kystvakt) companies in the area who own or operate 128 vessels and whose crews live in the area. One of the Academy’s offerings is a five-day bridge-management course aimed at the hardest skills gap to overcome for ship owners. It’s understood to cost $45,925.00 and one of Bourbon Offshore or Remoy Shipping with its Blueship X-bow PSVs seem to have first dibs on training. Despite a pressing need for captains qualified in bridge management and trained via simulator, the Academy is open “to anyone” and “not just the owners.” Other courses include engine resource management, crane use ($4,600) and deck operations. Subsea and offshore construction courses, we learn, “are on the way”, as is captaining, navigating, chief engineer, ROV and engine room controls. “They’re working on it,” says Bourbon Offshore’s Bjørn Remoy about the Univesity of Ålesund which oveseees the curriculum and runs the courses, including those at the Norwegian Centre of Excellence, another trainer, on the outside of town. After the campus tour, local legend and Olympic Shipping managing director, Stig Remoy, invites us and three shipowners to his head office conference room. There he tells us the Academy will become a “trendsetter” for equipping people to work on the most advanced designs. 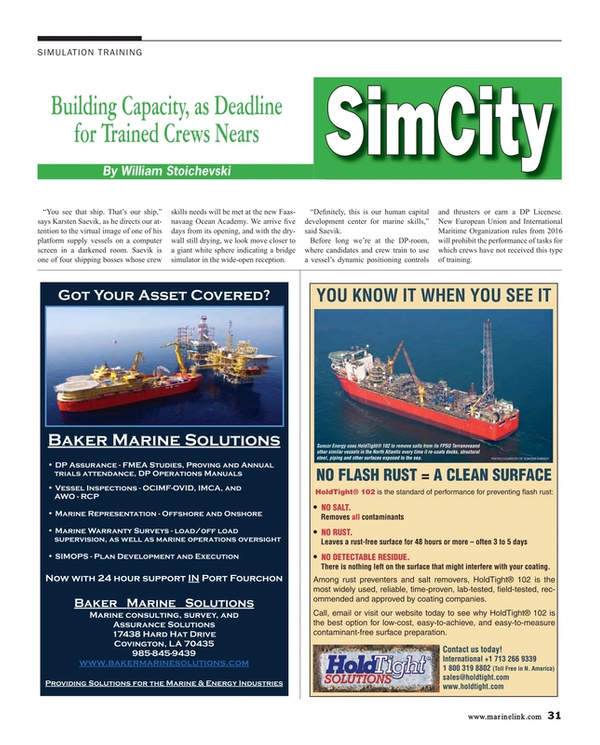 “The goal is to build magnificent people,” Remoy said, adding, again, that it won’t just be for offshore crews. The focus will be on sharing experiences between seafarers and companies. “It’s not just about buying steel anymore. I think you’ll see more hands-on owners, and we can create much more change here than in an ordinary school.” He adds that “ice-management” likely for ship stability training will also be added. Pressure to be compliant with European Union and IMO strictures and a need “to get the right number of people onto ship systems” has encouraged the school’s founders. There are 3,000 seafarers represented in this room who in one way or another need to go through that training,” Remoy asserts. It’s clear the training has been something of a burden, and the Olympic boss admits his people already endure some 600 course types and 80 audits, about half of which are Class. “This will continue to grow. It’s a neverending story,” he said. The Academy is managed by the same company, AKP, that runs the NCE, which also offers simulator training and sits on the other side of town, just across-the-street from a large area high school. The “industry campus”, as its CEO Per Erik Dalen calls the NCE, “tests the equipment of the future”. “This year we financed a subsea simulator, and then state-owned (Statoil) subsidized a second,” said Dalen. “Statoil does all their training here for their Aasgaard (subsea compression project) heavy lifts,” he adds. Upwards of 40 NCE simulators are the same versions as at the Academy. “A screen, a chair … some basic software. That’s what it is,” said Dalen. “What hasn’t been done before is connecting crane, deck, subsea, ROV and the rest in one place,” he said, and that’s what Faasnavaag and the NCE can do. It is understood they can also connect a vessel in Perth online to training at Aalesund. He admits “this house is full” and could use more square feet for extra marine focus in the curricula. Simulators, he says, could also speed innovation and virtual prototyping done locally. As we leave the NCE and Aalesund, we drop in on the high school across the street, where a major “career awareness” event is underway and is part science fair. We see teenagers wearing simulator helmets and watching simulated operations on the screen. They put career questions to “recruiters” from the maritime community. Among the hundreds of students, one kid has built a wooden X-bow painted like a U.S. Coast Guard vessel.